Charles Krick [?] Oswego Ore Box 196 [illegible]; Springbrook school from Mrs Overland. Return to Ed Reid. 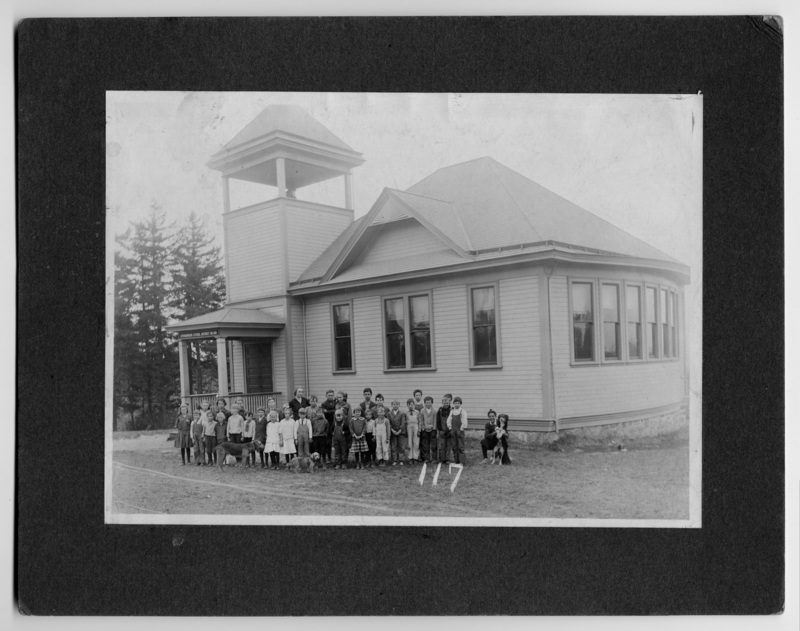 Springbrook School 1923[crossed out] ancestor of L.G. School. Picture courtesy Friends of the Library L. O. 860. Description Scanned as B & W; mounted on cardboard; stains and wrinkles along top edge. Same as 377b & 1608. Sign on building: School District No. 106. Chart accompanying: 2nd Springbrook School-1917 or early 1918; people identified by Donald Meyer: front row, l to r: ? ; __Files;__Gray;__Files; ? ; Howard Bogue; Raymond Stanton;__Files; Ralph Edwards; Donald Gray; ? ; Barbara Kirkwood; brother of person behind him; ? ; Ralph Meyer; __Fisher; __Smith; __Parr; Charles Sechrist; Clyde Keller with dog. Row 2: __Gardner; ? ; __Sechrist; Lona Kruse; Paul Gardner; Miss Ruth Smuchli; Charley? Krick; Hazel Files; ? ; Donald Meyer; __Smith; __Parr. Transcription Charles Krick [?] Oswego Ore Box 196 [illegible]; Springbrook school from Mrs Overland. Return to Ed Reid. Springbrook School 1923[crossed out] ancestor of L.G. School. Picture courtesy Friends of the Library L. O. 860.